From the steins of Germany to Japan’s world-class Sapporo, humanity loves its beer. We’ve been making it for millennia — so long ago that we’re not exactly sure which culture came up with it first (or if there was a “first”). The Chinese were brewing the stuff 9,000 years ago out of rice, honey, and fruit, while the barley variety cropped up in the Middle East at least 5,000 years ago. Then we got to the Middle Ages, and that whole “hops” thing really took off. Now you’ve had your history lesson, plus a few extra tidbits about beer’s beneficial properties. 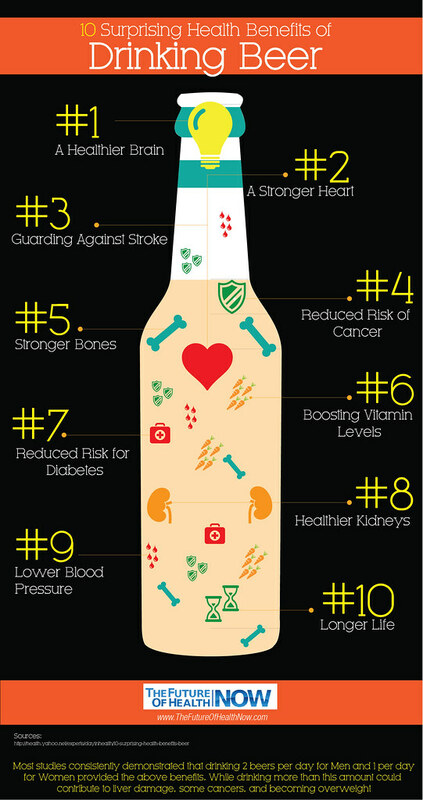 There’re a lot more good things about beer that that infographic left unsaid, so here’s another one from TheFutureOfHealthNow.com so you can tell your nagging partner/family member/friend that you’re totally just taking your medicine, man! Last, but certainly not least, is the all-important question of what food goes best with your beer. You don’t have to be a foodie to know or care about this stuff, it’s practically essential knowledge for any beer-drinker. With this food pairing infographic from TheSavory.com, you’ll always have the best chow to compliment your brew. Bottoms up!